Everyone must be familiar with the Health facts of Oats coz of media Advertisement related to Beta glucan and nowadays it has become one of the must buy thing in monthly grocery lists. Apart from Porridge, Oats can be used to prepare lots of delicious recipes and personally I use powdered Oats to substitute bread crumbs while preparing Fried goodies. 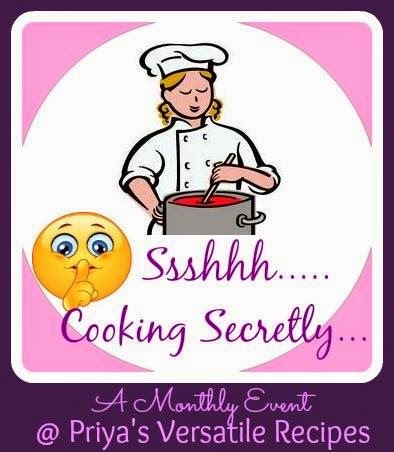 And coming to Today's recipe, Oats and Potato was the two secret Ingredients given in "Shhhh Secretley Cooking Challenge" hosted by Priya Suresh from "Priya's Versatile Recipes". I had included Carrot and Potato in this recipe but other veggies can also be included like peas, grated cabbage etc. These yummy balls can be served with Tomato Chutney, Coconut chutney or Sambhar and it's a perfect breakfast recipe to start a day with lots of energy. This can also be served as Evening snacks for kids. Mix Oats and Idly/Dosa Batter in a bowl and keep aside for 1/2 to 1 hour. Once it starts spluttering, add Jeera followed by urad dal and curry leaves. Add grated ginger and saute for half a minute. Now add the chopped onion and saute till it turns translucent. Add the remaining grated veggies followed by Turmeric powder and salt. Mix well and cook for 3-4 minutes in a simmer flame. Once done, remove from the flame and add it to the Oats batter. Mix well and add water if necessary. Heat Kuzhipaniyaram pan and smear oil in all holes. Take batter in a spoon and pour them in all holes carefully. Cook for 4-5 minutes in a medium flame and flip the other side using Kuzhipaniyaram stick or fork. Cook for another 3-4 minutes and remove from the flame. Serve with Coconut Chutney, Tomato Chutney or Sambhar. Mindblowing creation Priya, paniyarams looks prefect and filling for both breakfast and snacks..Well done. healthy paniyaram. Nice way to use up the left over batter. Very healthy paniyarams, yummy way of adding oats, have used the secret ingredients well..
My all time fav in healthy version. Looks fantastic. G'day! Love your photo and recipe! Thanks for all you do to inspire me!